Avila Beach Rental House. Life by the Sea. Avila Beach, California, charming beach house with ocean and San Luis Bay views From windows and deck. Listen to the waves and watch the ever-changing sea. Rental House Location: Close to the Beach, Avila Pier and the Avila Downtown area. The house sits to the south end of the ocean frontage area and looks out across the entire panorama of San Luis Bay with ocean views to the horizon, foothills and beach views. 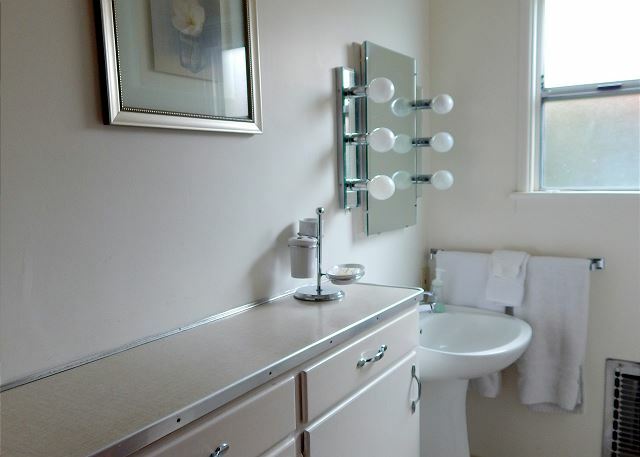 Enjoy this 3 Bedroom, 2 Bath, Charming Vintage Classic Beach House. Rental house is fully furnished and equipped with amenities. Ocean views. The Living room has cable TV/VCR. Kitchen fully equipped with breakfast bar, large and small appliances, dishes, cookware. Upper level has the kitchen, living room, full bathroom, the second & third bedrooms, and the large deck with ocean views. Lower level has entry from carport parking, the master bedroom, and the laundry area. Designated parking for one vehicle. King bed in master bedroom. King bed in second bedroom. The third bedroom has bunk beds. Sleeps 6 Bed and bath linens included with amenities. Wireless Internet now available. This property is equipped with a window air conditioning unit. "The location of the property for what we needed was great.the property did have everything it should but for what the cost I expected more .If I needed anything KEN was on it and I thank him for that." "We had a wonderful time at the house. It was just right for our family. The view from the large veranda was spectacular. It was within walking distance from the restaurants & shops on the main drag. Fabulous!" "Great location, easy walk to the beach, everything we needed!" "We stayed here with family to celebrate daughter's graduation from Cal Poly. The deck was the place to be - and the sound of the ocean at night was the white noise of heaven. Simple accomodations were fine - and the space worked great for the six of us (though the bunk beds were tiny) - and one adult daughter slept in a cute bed above the stair! Best beach around and lovely town! Easy help, too, as the property manager responded quickly to a request for a needed item. Terrific experience all around." 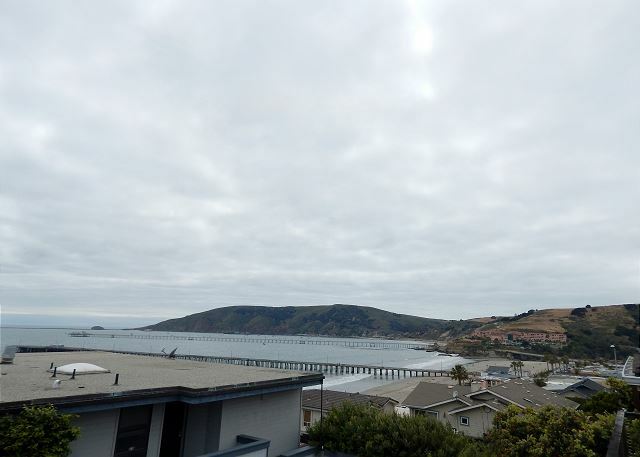 "Great location in an Avila Beach classic"
"Basic but clean and comfortable small house. Fantastic views. It's a bit of a hike up the hill from the day on the beach, but the view makes it worth it. Renovation of house behind us had the workman clanging and yelling at 7am, which was not great for the sleeping grandchildren. Otherwise, we enjoyed our stay and would rent it again." "Although I was not there for vacation but for work instead, it was a great place to stay and to relax after work, the view is great! " "We loved our little 3 bedroom condo. 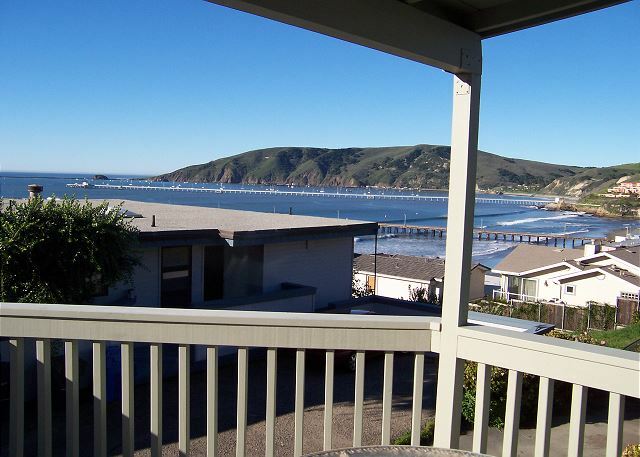 It was perfect for a family of 6 with a wonderful deck to watch the sun come up and set over beautiful Avila Beach. There was a bar-b-que on the deck so we lived out there. The unit was clean and a little dated but that added to the charm The biggest inconvenience was having to drive to Pismo Beach to pick up and drop off keys. We would love to stay again soon!" "Very nice and comfortable home. The wood paneling reminded us of our grandparents' cabins! Close to downtown, although you may or may not appreciate the "climb" back up the hill after a nice meal at the Custom House!" "This was a perfect spot to spend time in Avila Beach. The place is a very short walk to the beach and downtown. When not at the beach we spent a lot of time on the deck enjoying the view. The house itself was clean and had everything we needed. Beds are comfortable. Downsides are: 1. need to do your own dishes-no dishwasher and 2. noise from the parking lot shared with the close-by neighbors. Retrieving the key from the prop management company instead of a lock box was also a minor inconvenience. Overall, we recommend and would stay here again." "Everything was GREAT! First time renting a house for a coastal trip and we were not disappointed at all. Everyone had a great time, the house was spacious and the patio deck was a great place to relax and play many games, it was definitely the family hangout. Thanks for a great experience, we will be back!!" "Great location....short walk to beach, shops and dining. Rental company is very accommodating. " "Our family loves this rental for our biannual trip to Avila Beach. It's affordable, has nice views of the beach, a comfy living room for games and is a short walk to the beach. The office is helpful, kind and professional and we have always had good experiences with Coastal Vacation Rentals. I recommend staying here if you are looking for a casual, convenient, cabin like rental home for your family. " "Our family of 5 (3 grown children) had lots of space to sleep and hang out in this quiet, off-the-street home in Avila Beach. Because it was winter we didn't get to enjoy the deck much, but the afternoons were awesome! The beach and beachfront were only two blocks away (down very steep streets)so we took lots of walks to the beach and pier. The only concerns were that the furnace thermostat was well hidden on the bottom floor, and then once we found it there was no heat (no vent) in the bunk room so we had to adjust bedding to compensate - night one was pretty miserable for our girls." "The house has everything you need. Awesome deck with ocean view. Yes, the furnishings are a bit outdated, but it was charming - knotty pine walls, etc. Very clean. We celebrated a bit during our stay and invited the neighbors over to talk and play guitar on the deck - neighbors were local and very friendly. The house is located a short walk up the hill - excellent location. I would recommend this house and will stay here again." 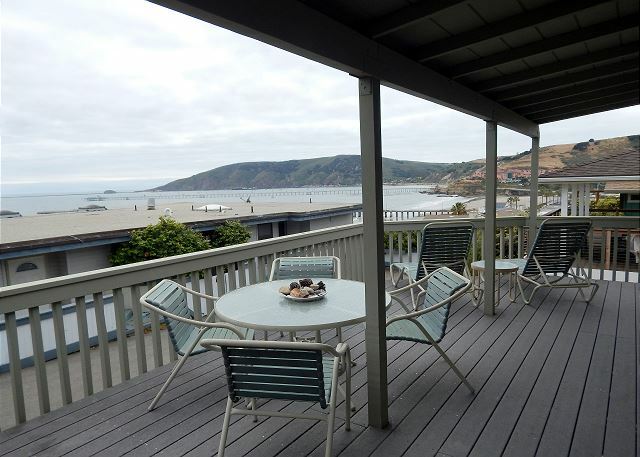 "It was a great vacation and the location was perfect, "
"We enjoyed our time in Avila Beach over the weekend!" "The house was exactly as advertised. It is in a very quiet neighborhood so you will only hear the surf at night while you fall asleep under cool ocean breezes.The house is a five minute walk downhill (10 minutes for the return) from the beach and boardwalk. " "We had a great time love the place clean close to the shops beach and the view at night is breath taking! "We rented the house as we were attending a show in Avila that weekend. Cool, old school charm. Nice deck and views. Clean and comfortable. Basic kitchen. No dining table but nice bar with 8 barstools surrounding.Good location." "We meet every summer in Avila with my family (me,hubby and two children) with my Aunt and Uncle. We love Avila and the fun outdoor activities that the beautiful little beach town provides! This house is an older home with an amazing view! The deck is spacious and has just about a full view of the beach and pier. The images on the website don't do it justice. The house is very clean but could use some updating with the furniture and electronics. The beds are very comfortable and the kitchen offers everything you need for home cooked meals! " "The house was perfect, had everthing we needed. The deck was fabulous, and the view outstanding. I definitely would stay here again!" "I think I found a new vacation spot for many more years to come. loved the town and golf course was beautiful. " "I was wowed the second I walked in. The pictures online did not do this property justice. Wonderful stay, incredible location, unbelievable time. I would recommend this place to everyone!" "It certainly was acceptable for the last minute scheduling. 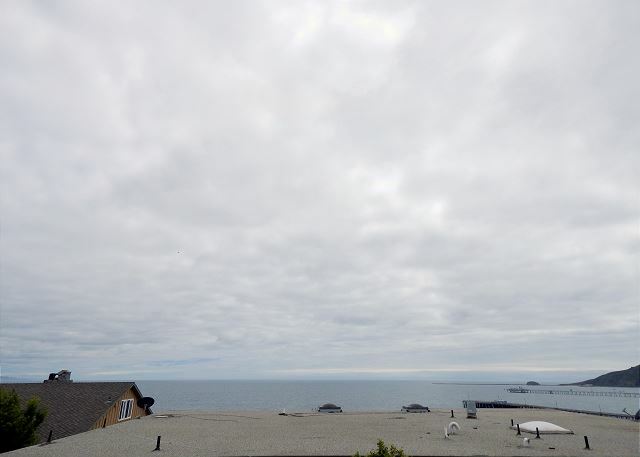 I would prefer a place with more of an unobstructed view.."
"I was satisfied with the overall stay. The draw back to this location is the insufficient parking for a three bedroom apartment. There is only one parking spot assigned to the unit and the neighbors would take that spot. It leaves you parking on the road many times a block or twoo away. I would stay in this unit again after exhausting any other options." "The house was perfect for us...the view from the deck was amazing, beds were comfortable. Very clean and relaxing. Overall a great rental that I would recommend. The only downfall is there is only one assigned parking space, which is precariously located (tough to get in and out of) and very small. For a house that sleeps six people and for the rental price, more parking should be included. " "We actually stayed for 33 night total in the vacation rental and it was amazing as always. We have been coming for years now. We hope to see the place updated sometime in the near future. TV and entertainment systems are out dated. Thanks again!!!" "Everything was wonderful as always. We have been coming for years and we always have a great time. The only thing we wish is for the vacation house to be pet friendly. It's an older property and in decent condition. I was hoping with the large deposit we put down that we would be able to bring our small dog. Thanks again for the incredible time. See you next year!" "Great location.....unit needs some work...light bulbs etc... Enjoyed our stay. Might want to let guests know there is no bathroom soap." just stay in Avila all weekend. So relaxing and glad we bought groceries before we got to the house. Stay here if you looking for an amazing deal and cozy place to share with good friends. Thank you!" "the home had a smeel of mice **** and **** for the first day and a half, I think aftr that the smell just burnt my nose and I could not smell any more, I was bordering on sleeping in the car the first night." "The location of this home was gorgeous, but I was not impressed with the cleaning of this place. I am aware that this is an older home, but there were spider webs in the bunk beds, dead bugs in the pantry, and we had trouble with the window blinds (we wanted them open to enjoy the beautiful view). The furniture was very old, and there was not enough room to sit with 3 kids and 3 adults. After we got those few flaws out of the way we were able to enjoy ourselves. We loved the deck but the BBQ was very dirty. I would recommend this house to others with the information and warning that this is an older home but worth the price. " "The only issue was we kept stepping on carpet tacks where the carpet met the bathroom floor on the second floor. I had to put a towel down. Someone should repair the carpet there. Everything else was great." "Overall all the house has a good location and awesome view but for the price, the house was a little compact and the upper bathroom exhaust light didnt work. Also the Upstairs heater worked on and off." "Cold upstairs as older home, had to put heat up high for a while...Otherwise, very quiet and comfortable." "The kitchen could be better equipped. Living room furniture uncomfortable. Great location. House clean. Great layout!!!" "Very comfortable and clean. Great view from large deck. "